If you are familiar with vSAN, you already know that the VCG is a “must follow” guide to success. In certain instances, deployments may use ESXi OEM/custom images based on internal policies or even personal preference. However, these type of images contain vendor specific tools, drivers, etc. One of the results from using such images is the use of async drivers for storage controllers rather than inbox drivers. For sake of demonstration, we can focus on the PERC H730. While checking config assist, you can see a warning stating that the recommended driver per the VCG is not currently installed. In the picture below you can see that we have uncertified drivers, and we need to roll the drivers back to the correct version. Links to download such drivers are typically found within VCG or the ESXi “drivers” tab from the downloads page. In some occasions, this link may not be present for the version that you are running. So how do I get the correct drivers? You certainly don’t want to be running drivers that have not been certified for vSAN, do you?!?! Of course NOT. You can get such drivers from the ESXi offline bundle of the version you currently have. For example, let’s say you are running ESXi 6.5 U1. You will need to go to https://my.vmware.com, log in using your credentials, go to downloads, and select ESXi 6.5 U1 as the product. Download the Offline Bundle (zip). Once completed, unzip the file and navigate the vib folder until you find the correct driver. 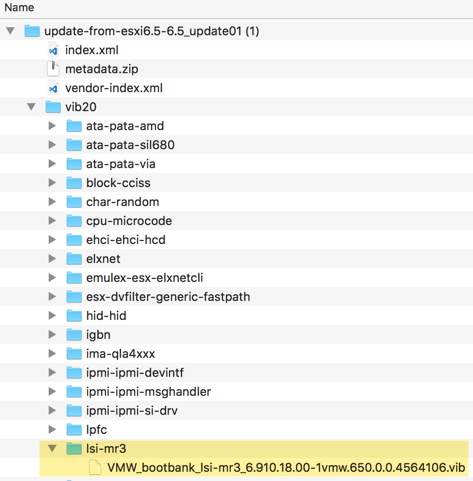 In this case we are looking for lsi_mr3 version 6.910.18.00-1vmw.650.0.0.4564106. You can then take that vib and use your preferred vib install method to update your drivers. ← What is VM Overreserved and Why is it taking so much Space?